Scott Halleran/Getty ImagesTiger Woods’ play at the PGA Championship has people bringing up Jack Nicklaus’ record again. Tiger Woods came close to winning his first major in a decade at the PGA Championship, finishing second to Brooks Koepka. The strong play at the last two majors has many thinking it is just a matter of time before he breaks through again. That buzz has already led to some whispering about the possibility of breaking Jack Nicklaus’ record; something most had already given up on. Tiger Woods still hasn’t won a major in ten years, but his recent play at the majors has people thinking his drought will end soon. Some are even whispering once again about something most had given up on – breaking Jack Nicklaus’ record of 18 career major championships. Mike Greenberg of ESPN’s “Get Up” noted that Woods might have won the PGA Championship if not for his play on No. 17 in the third and fourth rounds. If Woods had won, Greenberg believes there would already be a major buzz about the record. 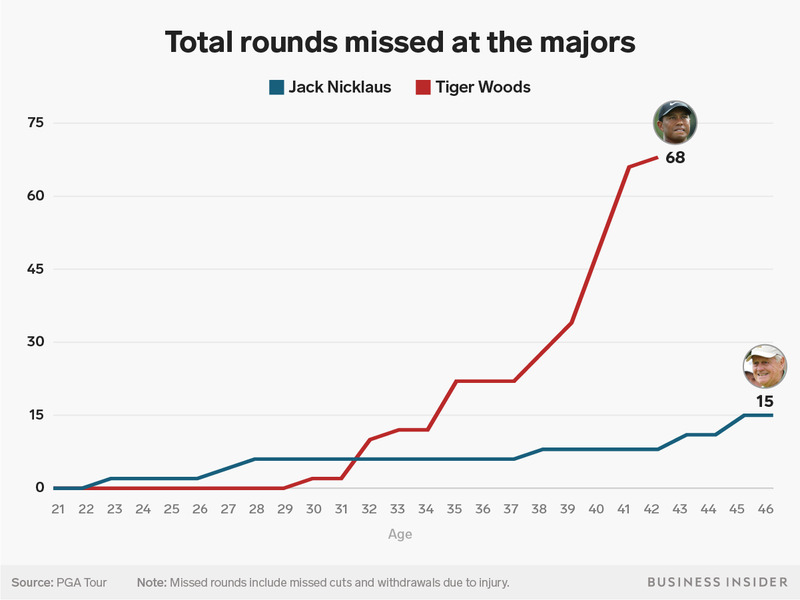 The problem is that we have no idea how long Tiger can continue to play at a high level – he will be 43 when the 2019 Masters rolls around – and we have no idea if his back will hold up under the constant torque of 300-yard drives and the pounding of walking 18 holes 5-6 times per week. The ugly reality is that Woods has likely already missed his opportunity to challenge the record even if he can stay healthy. The biggest factor is just that he did not give himself enough opportunities. In Tiger’s pro career, he has already missed 68 rounds at the majors due to either injury or missing the cut. 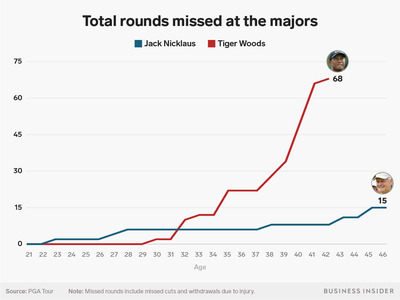 At the same point in Jack Nicklaus’ career, he had missed a total of eight rounds, and he only missed 15 by the time he won his final major at age 46. The other factor working against Woods is the depth of good golfers in the game today, a point made by ESPN analyst and former PGA Tour caddie Michael Collins. The good news is that most now think Woods can win another major. But there is no guarantee it will happen, and there probably isn’t enough time to win four or five against all these young golfers who are not afraid of facing Tiger. In other words, let’s see if Tiger can get to 15, or even 16, before we start worrying about the record again.